If you own a PicoBrew Pico, your beer will be created by adding a PicoPak to the automated brewing system. The PicoPak contains recipe information like hop additions, fermentation temperature, and more. Inside of the package is all of the crushed malt and hop canisters. Unfortunately PicoPaks cannot be reused at this time, so you will need to buy a new one each brew day instead of refilling one with new ingredients. There are however a bunch of recipes to choose from in the PicoBrew Marketplace. Adventurous brewers also have the option to create their own custom PicoPak. There are two layouts for recipe building. You can toggle between the two by checking or unchecking the “advanced” box in the top right of the screen. You can either drag and drop or press the add button to add grains to your recipe. Remember to read our grain bill principles article before selecting your grains; this will help you create a balanced beer. In my hoppy Kolsch, I opted for primarily pilsner malt with minimal additions of vienna and carapils for a slightly richer color and better head retention respectively. 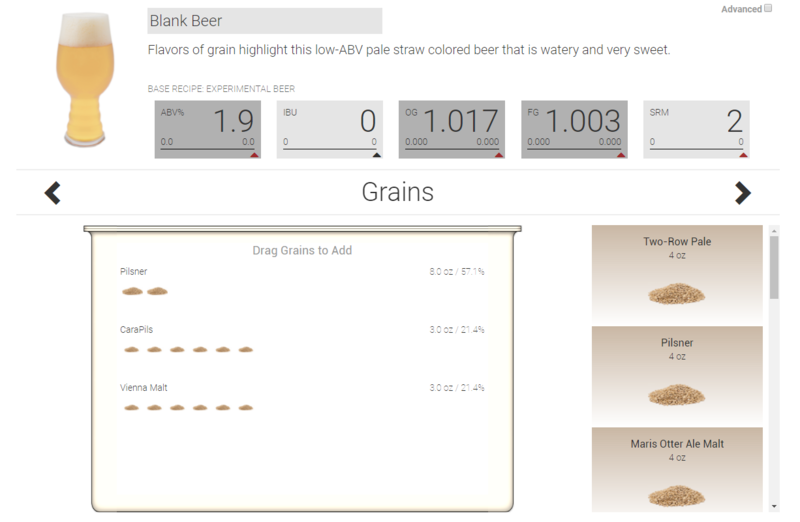 You will notice that as you add ingredients to the beer, the stats and description of the beer will change respectively. There are large arrows to the left and right of where it says “Grains”. These are how you navigate between components like grains, hops, yeast and dry hops. Hop additions are broken out into “bittering”, “flavor”, and “aroma” additions. You can again either drag and drop into a table or use the sliding bar from the advanced toggle switch. Yeast options for blank beer are limited to Safale 05, and dry hop additions are similar to the regular hop additions section. The custom PikoPak feature is a nice addition to those looking to craft their own beer recipes, however there are still some limitations with the system. It’s still in a public beta, so hopefully some of these pain points are addressed later down the road. Limited Ingredient Selection: Grain selection is limited to 12 different types of grain. This is pretty limiting as far as creativity goes, but you should be able to build most basic styles, but I’m not sure it’s enough to satisfy homebrewers for very long. Hop selection is even more limited to just 8 varieties, with 5 of them being IPA / Pale Ale style hops. These selections do not differ if you experiment with a base recipe either. You won’t be able to really brew any English styles of beer such as ESB with the current selection of hops. If none of theses strains are what you’re looking for, you can buy your own yeast from a separate vendor. There are infinite more options from companies like White Labs, WYeast, and Mangrove Jack’s. Since the yeast is added manually by the brewer, you can use any yeast you wish. The downside here is that you need to buy yeast twice, as it can’t be omitted from a custom PicoPak order. While there are a few limitations, both newbies and seasoned homebrewers can still craft solid recipes using a custom PikoPak. The limited options help keep newer brewers from becoming overwhelmed with options, decreasing the chance of making mistakes.